The broadband picture in Northern Ireland is changing and now seems to be at the forefront of the full fibre race. The nation has a combined FTTP coverage of 11.67% which is a mixture of Openreach GEA-FTTP and Virgin Media Project Lightning. 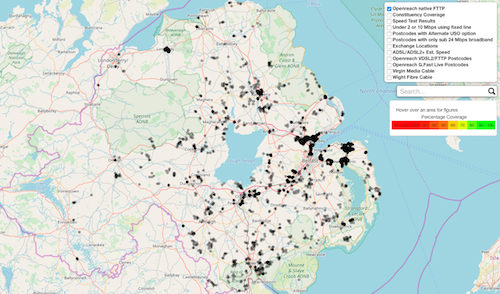 Northern Ireland has jumped ahead due to finding both more rural FTTP which is helping to boost the superfast coverage levels but also a lot more commercial roll-out with VDSL2 areas seeing widespread overlay of FTTP. The Openreach GEA-FTTP coverage currently stands at 8.45% of premises. We believe there is more FTTP to be found as there are plenty of areas in Northern Ireland we have not checked yet. This increase in coverage has also had an impact on the UK wide picture, since as of this morning we have 683,990 premises of Openreach FTTP in our statistics which when combined with the G.fast footprint of 1,364,376 premises is an Openreach ultrafast footprint of 2,048,366 premises. The FTTP footprint has grown from 654,357 on 7th January which is a rate of 15,000 per week. Are these countryside fibre connections all FTTPoD? Fingers crossed better news this year. FTTPOD was a 39K quote so didn't bother with a survey. Great to see the rate of rollout increasing, in line to over double FTTP number this year, if it keeps going up we may even treble numbers to hit 2m. NuttyMucker if you're in Craigavon or Lurgan you're right. I have been privvy to the VM expansion map and all the main areas of both will be covered.